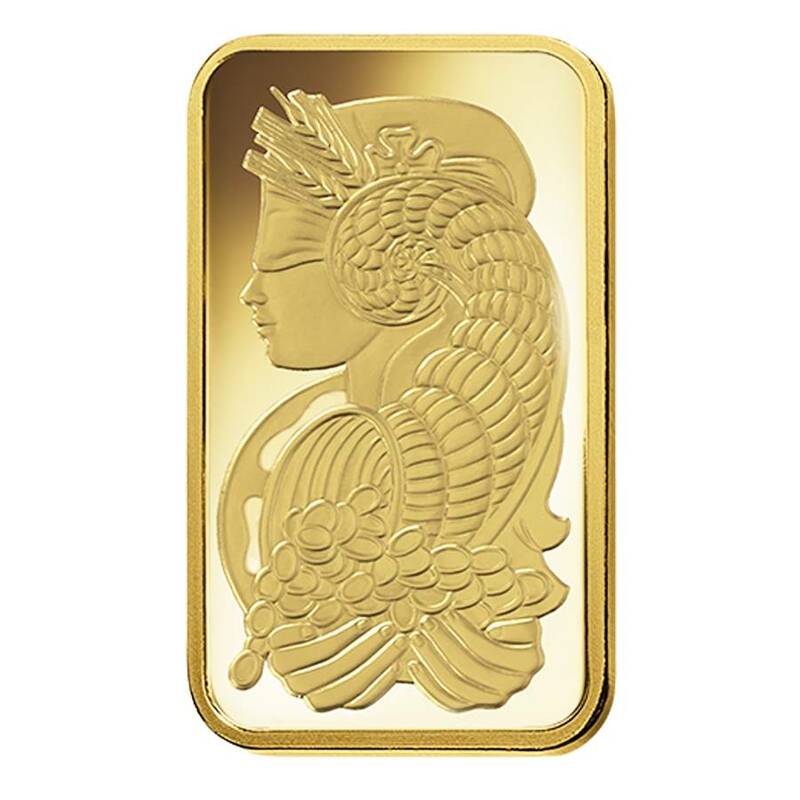 This fantastic 20 gram Gold Bar Lady Fortuna is produced by one of the most famous bullion brands in the world - the prominent PAMP Suisse. Minted from 20 grams of 99.99% pure gold, this outstanding gold bar showcases the well-known Lady Fortuna - the Roman Goddess of luck and welfare. One of the premium international refineries, PAMP Suisse, was established in Ticino, Switzerland in 1977. 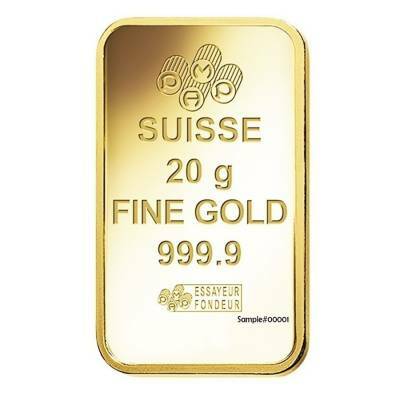 The company was instantly loved by investors and collectors due to its innovative bullion of superior quality. 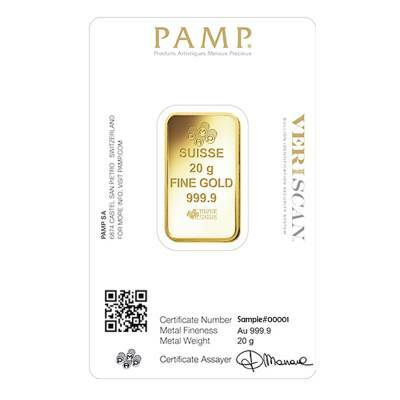 The mint is also highly praised for incorporating the latest bullion security measures such as the newest Veriscan® feature - a one-of-a-kind microscopic surface topography which is used as a digital fingerprint for scanning and registering the bar in PAMP’s special database. This digital fingerprint can be accessed anytime to confirm the bar’s authenticity. The latest PAMP Suisse Lady Fortuna gold bar also features this security measure. This outstanding bar is struck from 20 grams of .9999 fine gold and displays the famous Lady Fortuna design - the Roman Goddess of fortune and prosperity. She is depicted as wearing a blindfold, the symbol of life’s unpredictability while sharing her overflowing rich cornucopia. 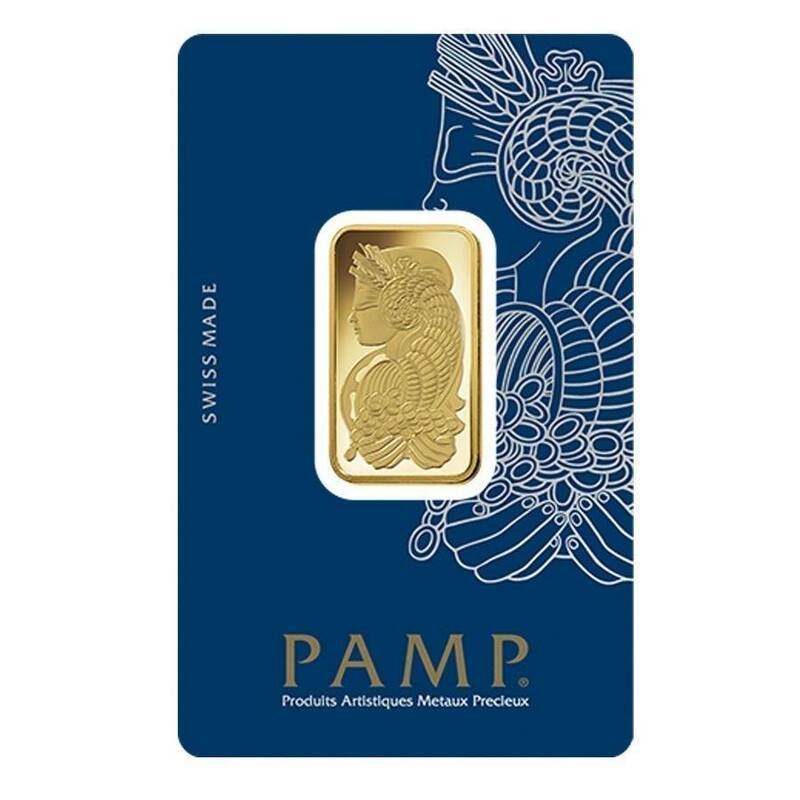 This beautiful 20 gram Gold Bar PAMP Suisse Lady Fortuna is an excellent gift option and addition to your collectible portfolio. 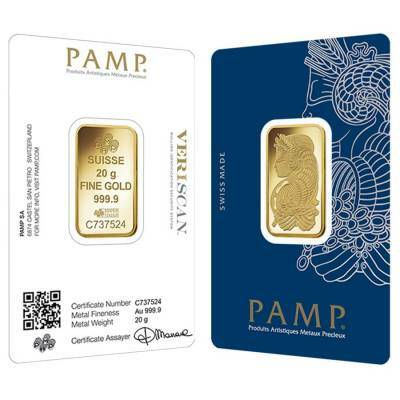 Offered in its mint assay card and backed by PAMP Suisse. Eligible for IRA and comes with a unique serial number. 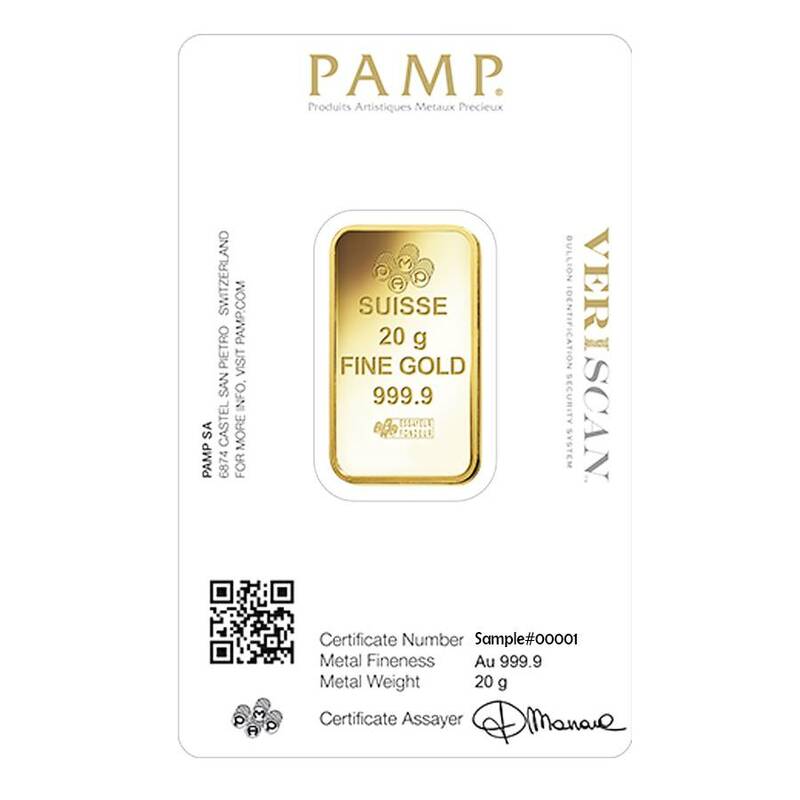 Incorporates the newest Veriscan® security feature - each bar has its own microscopic surface topography which is considered as a digital fingerprint used to register the bar in PAMP’s mint catalog and can be accessed later for further authentication. Obverse: Features the impressive image of Lady Fortuna - the Goddess of welfare. ‘Lady Luck’ is also considered as the protector of grain supplies, according to Roman beliefs. She is depicted with a blindfold - the symbol of the unpredictability of life - while holding and sharing her wealthy cornucopia. 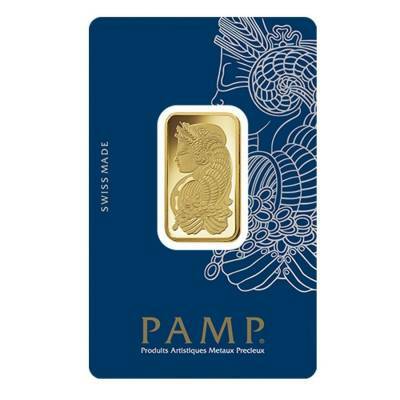 Reverse: Showcases the well-known logo of PAMP Suisse, as well as the engravings of the purity and weight of the bar. Also engraved is the words “Essayeur Fondeur”, confirming the bar’s authenticity, and the unique serial number. At Bullion Exchanges, you can be sure that you will find gold bars of the highest quality. Order this exceptional bar and add it to your precious metals investment portfolio by clicking on ‘Add to cart’. Get your bar will be safely wrapped and packaged to be delivered to you! For any questions, just contact us at 800.852.6884 or message us, and we will happily assist you. PAMP bars are bestsellers on the market. Will be perfect for any level of collectors. Pure gold content, trusted refinery, and sharp looking. Bullion Exchanges has amazing customer service! My transaction went without any issues! Thank you guys! With this purchase, you earn 851 Bullionaire Bucks 851 BB = $0.85. We currently have 432 of this item in stock. For every $1 spend, you will earn 1 Bullionaire Buck which is equivalent to $0.001 off a future purchase. 851 BB = $0.85.